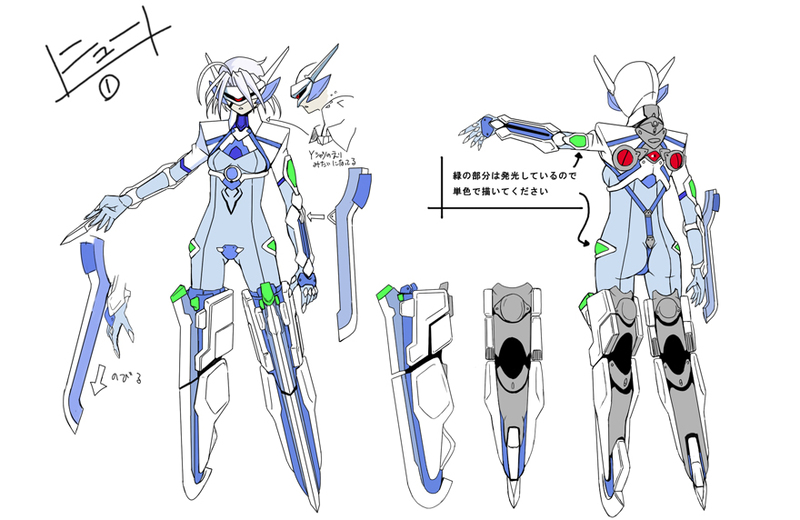 ν-13 is a Mecha Musume who was sealed in the Sheol Gate. She was programmed to terminate anyone she deems as hostile subjects that come near the Gate. 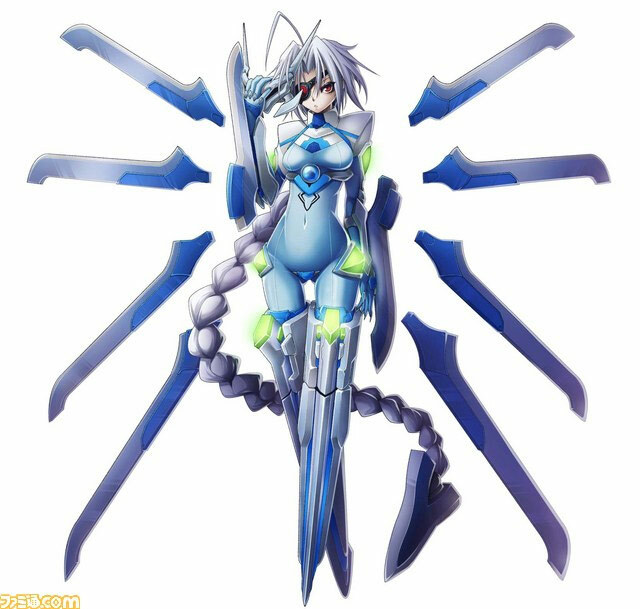 ν-13 is also shown to have a split personality, split between an emotionless girl when around others and a Yandere when around Ragna, though this may be how she was programmed to act. 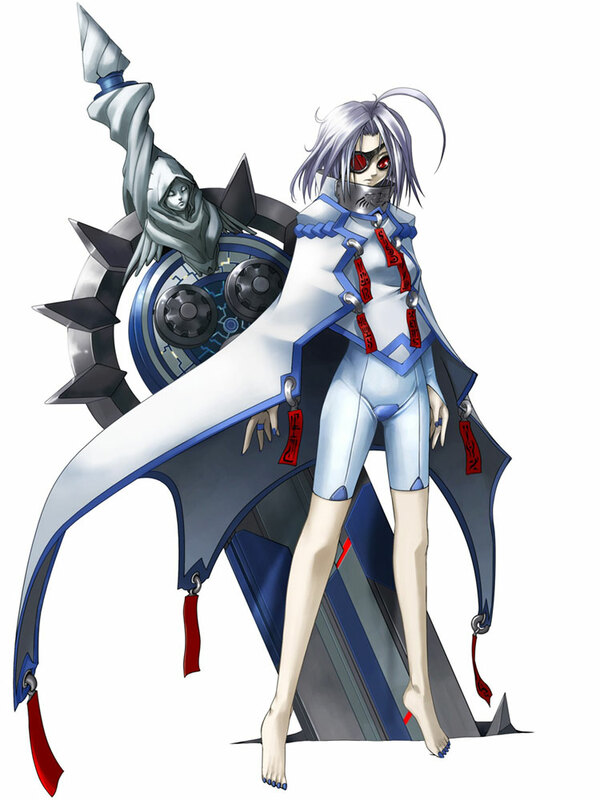 ν-13 wants to absorb Ragna and have him join her in destroying the world, because she, too, possesses a piece of the Azure Grimoire (Although neither she nor Ragna realized the pieces they possess were actually imitations). When Ragna refuses to join her and breaks her heart, she decides to take him by force. She also knows Hakumen, recognizing him as a "Sankishin Unit". 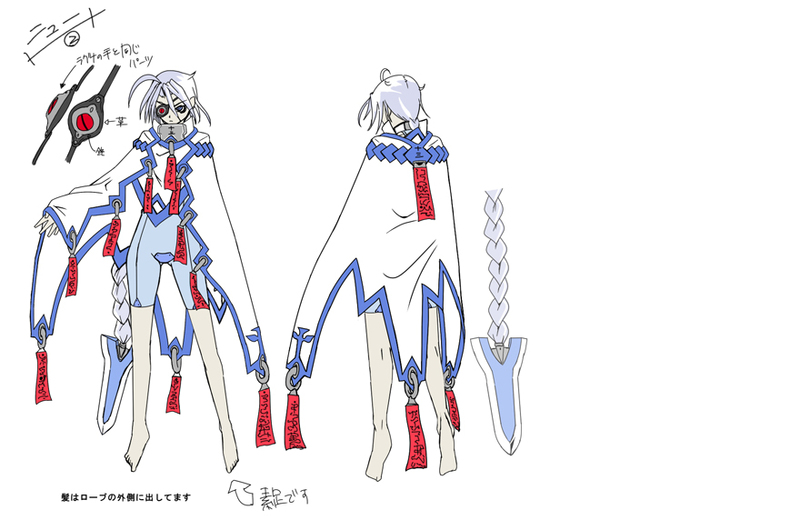 She, as with Noel, was made as a replica of Saya, Ragna and Jin's sister, who is presumed to be dead. 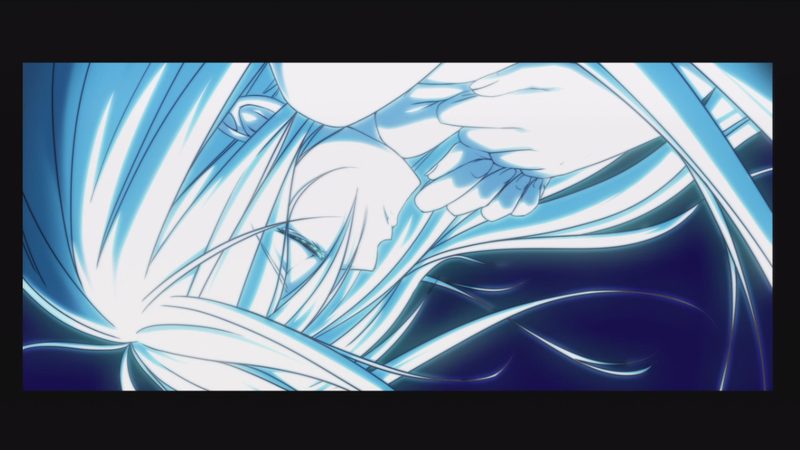 They seem to share some of Saya's memories, though nothing congruous. When Ragna and ν-13 merge they become the Black Beast, something ν-13 seems to be intent on causing above all else. 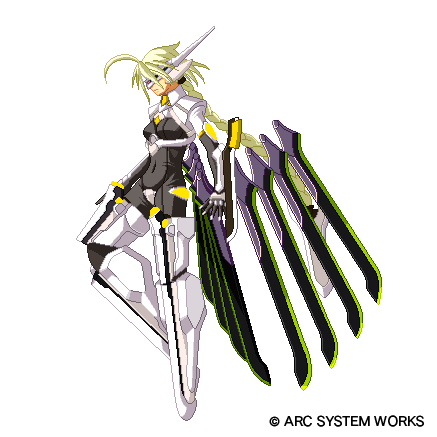 In battle, she summons numerous swords to keep pressure on her opponents from a distance. 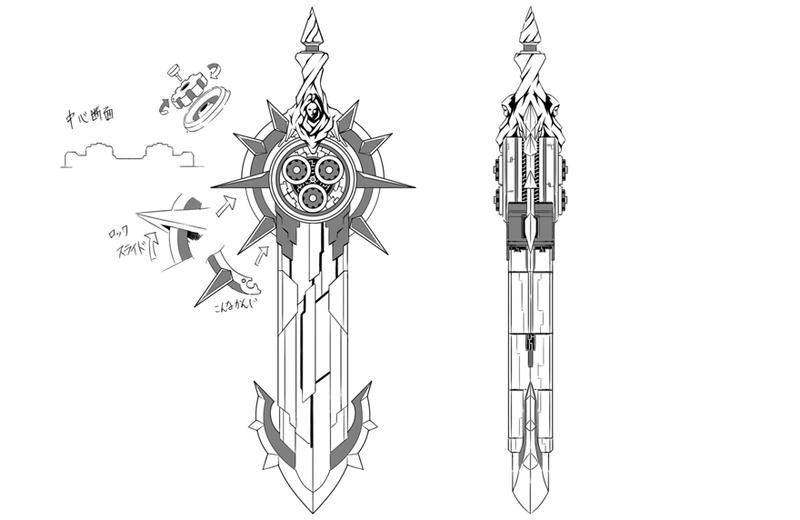 Her battle appearance even stems from an apparatus, resembling a large sword with a face, that breaks apart to become her armor and weapons. Lambda is an imitation Murakumo Unit created and controlled by Kokonoe by combining the body of the 11th experimental replica of Saya with the soul of ν-13, recovered after falling into the Sheol Gate. 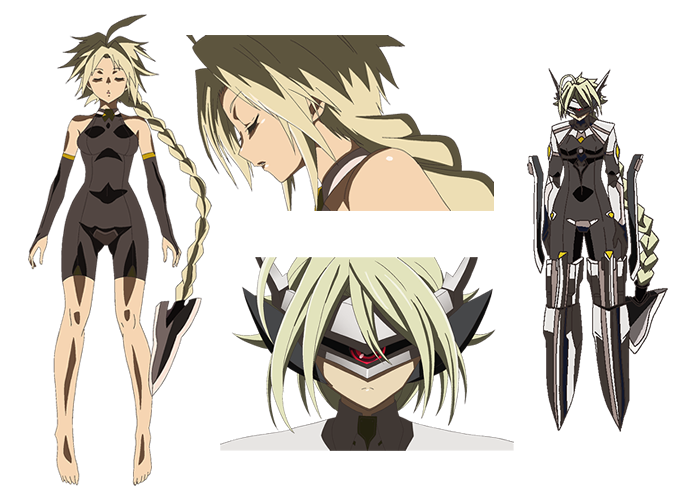 Lambda was originally created by Relius Clover for the purpose of serving as a test subject for the experiments of the NOL's scientists. 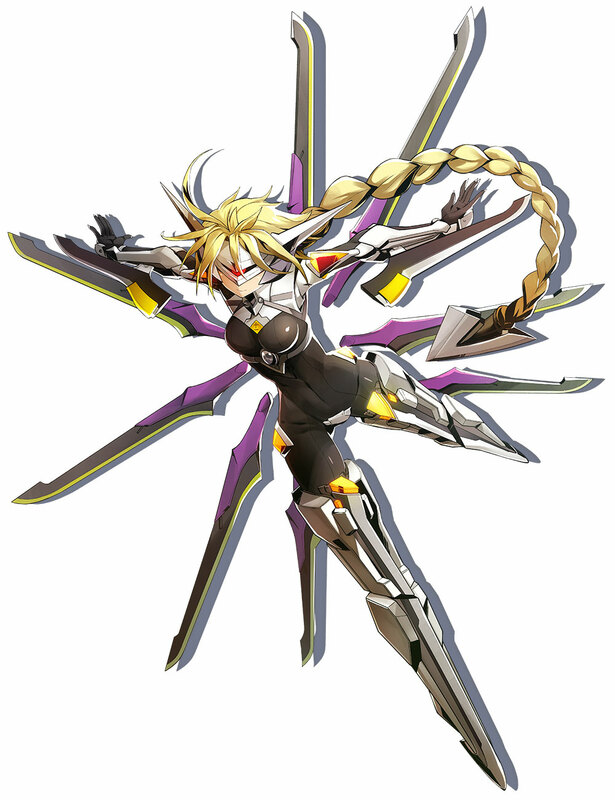 Lambda died during the painful experimentation and was disposed of, deemed a failure. 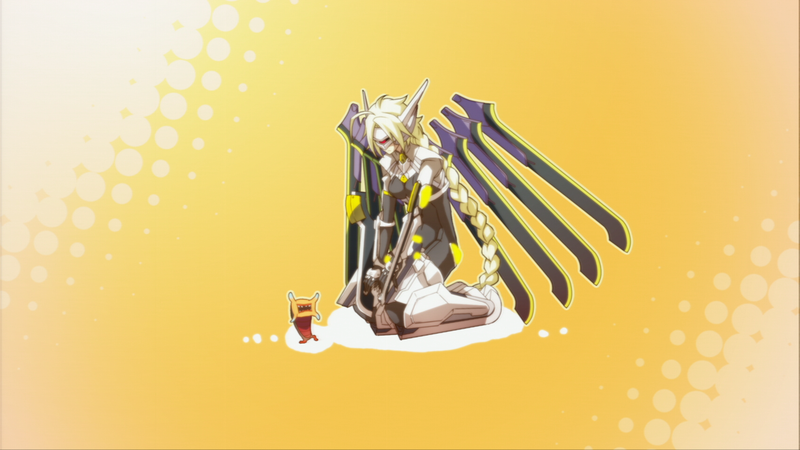 She was later retrieved from Ibukido by Iron Tager and revived by Kokonoe. Kokonoe completely erased her memory, and as a result, Λ-No.11- is only interested in carrying out Kokonoe's orders. 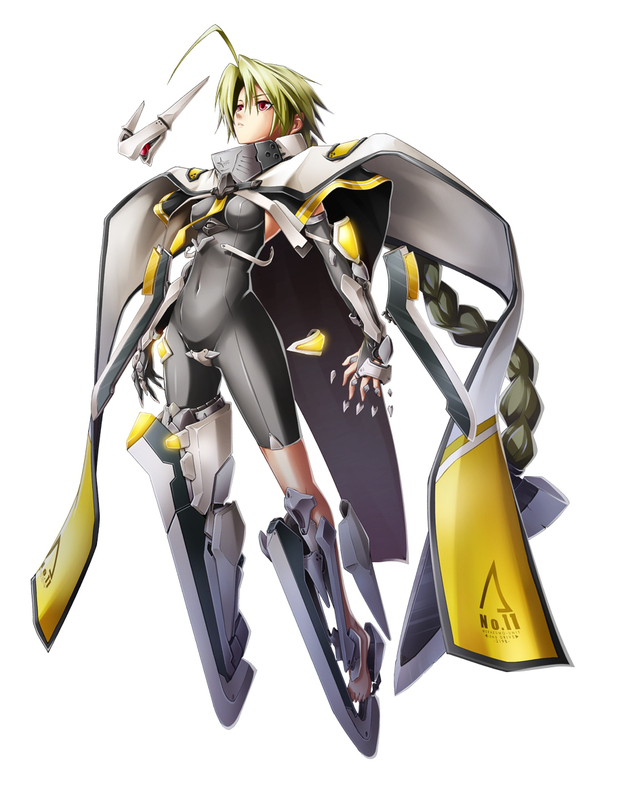 Due to having Nu's soul implanted within her, Nu's memories occasionally try to come back to her, causing her great pain, something Hazama takes full advantage of by merely mentioning Ragna the Bloodedge. 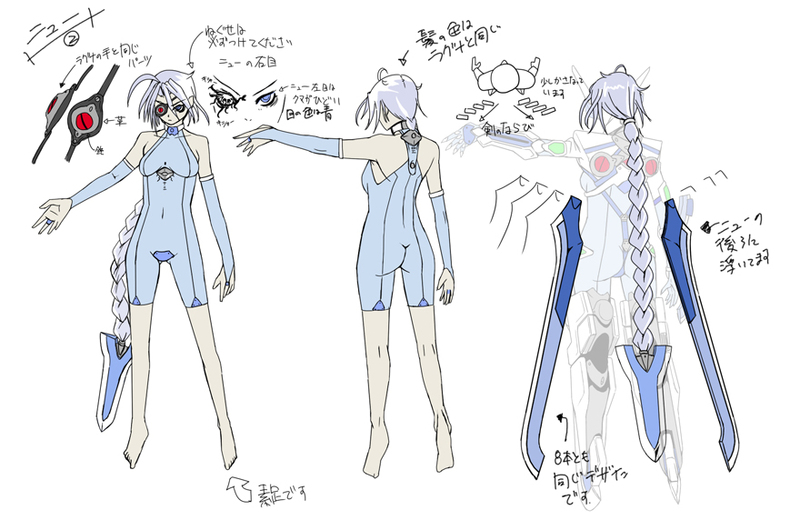 Though she's a fairly cool "robot anime girl" design, her typical fighting game boss-like attributes and cheap moves make her an easy design to hate. 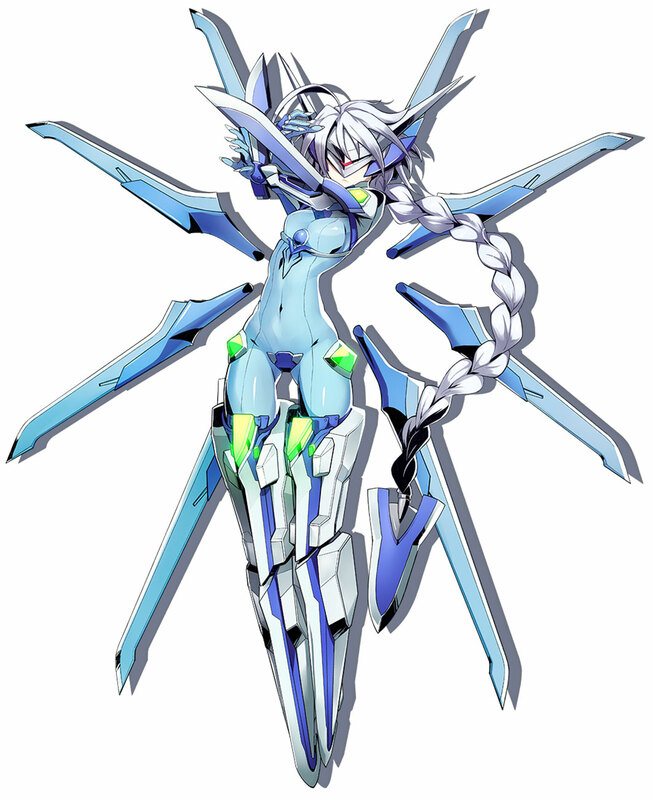 I especially found her English voice annoying... so very annoying. Blah! 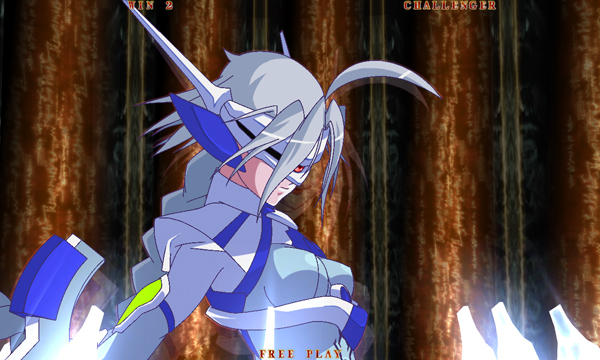 Her special move that slows down her opponent's movement is kinda cool... and she does have some quality animations. She's not my cup of tea as a fighting game character, but she's not a bad design. 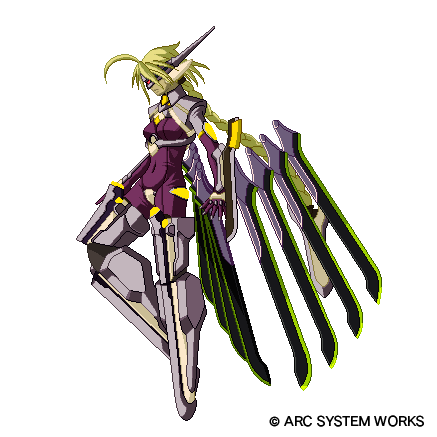 Even though ν-13, Nu-13 and Lambda-11 are different characters in the storyline, the character design is practically the exact same (minus the moveset). 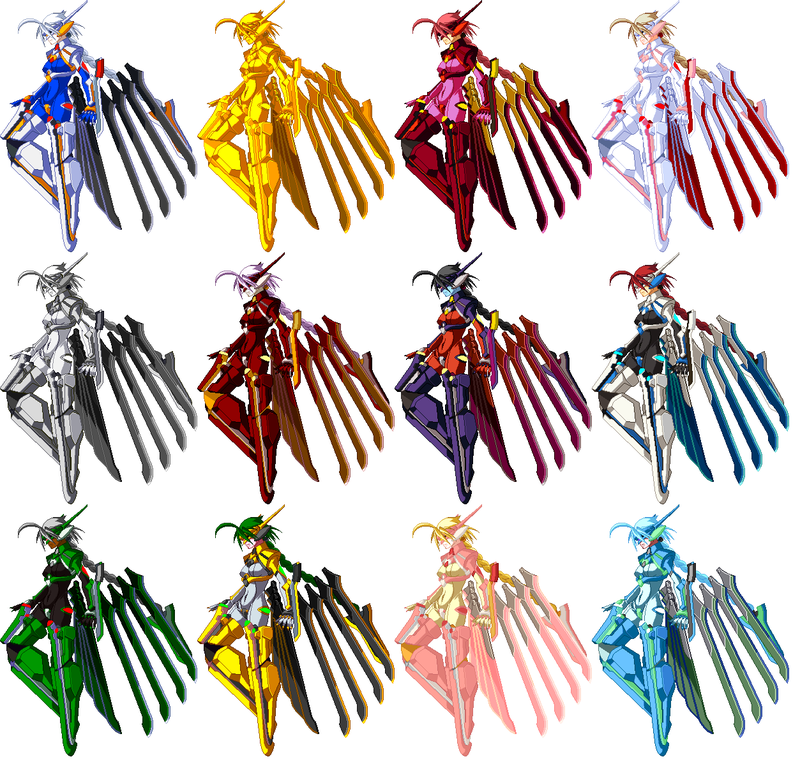 It's all very confusing for a non Blazblue story expert... so forgive me for putting them all on one page. lol. Let's hope Arc System Works just doesn't clone another one... for f*ck sake.